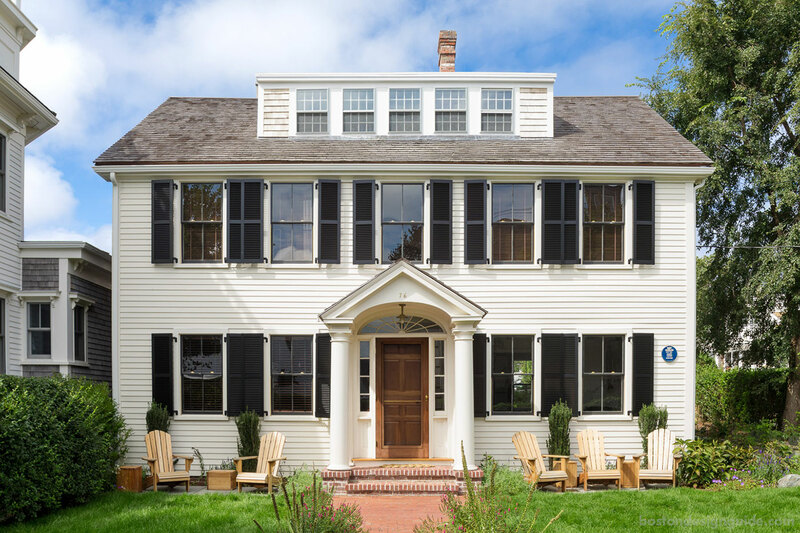 When a client from Manhattan sought to revive and add to a historic home on Provincetown’s Commercial Street, one of the seaside destination’s most coveted thoroughfares, they looked to Bannon Custom Builders. It wouldn’t be an easy job. Though the property reads like a single colonial home from the street, it is actually a four-unit condominium. The home receiving the rehab is the majority shareholder, occupying the first and second floors of the colonial and the lower level of an L-shaped extension. A neighboring home sits just five feet away, which, while standard on the main drag of this iconic locale, complicates construction. Considerably. 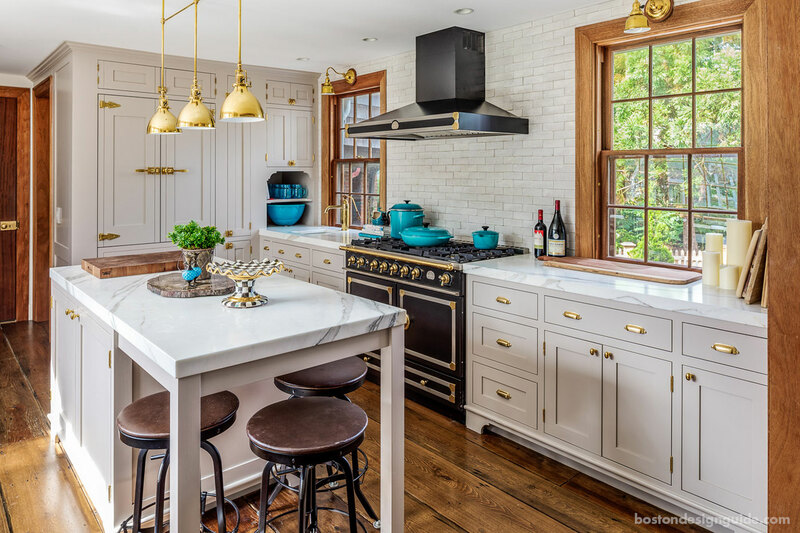 The kitchen, a glorious mix of old meets new, resides in the “L” of the home. Paul Bannon, owner of Bannon Custom Builders, is unfazed by complicated projects, however, which is one of the reasons why the high-end Cape Cod builder was selected to work with Hammer Architects on the Provincetown period piece. 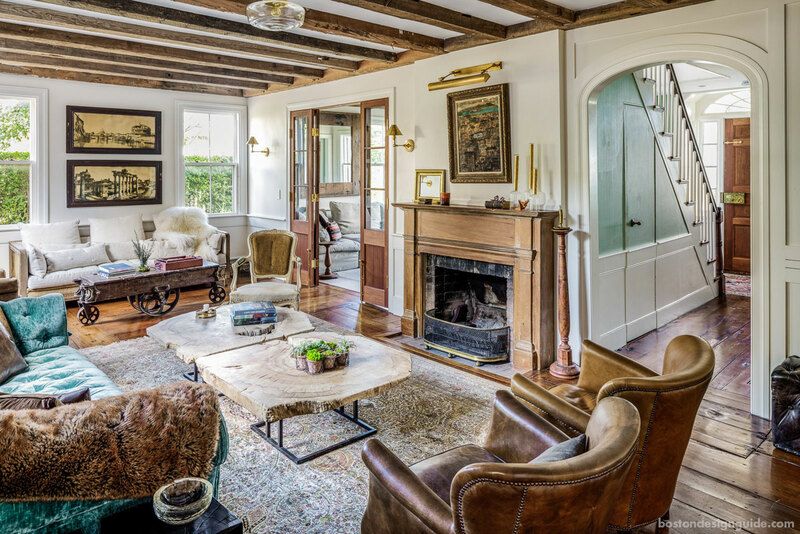 In addition to breathing new life into the interiors and exterior of the home, the renovation entailed adding a full-size basement with a living room and wine room beneath the colonial’s first floor. Being from the Big Apple, maximizing available square footage was a must for the homeowner. 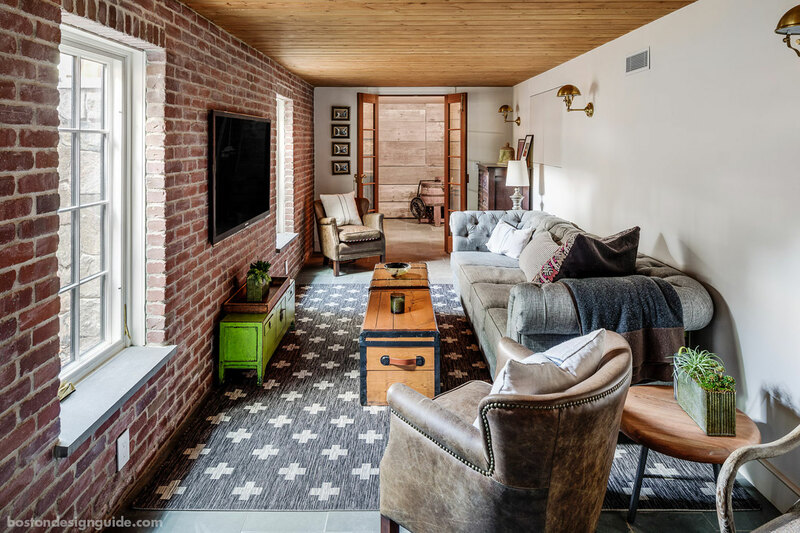 Brick was used in the basement to create the feel of an old home. Structural deck was used on the tongue and groove ceiling, as the floor was thinned to get more headroom. The wine room, seen through the doors, was crafted in reclaimed wood from upstate New York. To achieve this, Bannon Custom Builders had to pick up the entire home and excavate underneath to carve out a subterranean lair. Given the proximity of the neighbor’s home (and the fact that its foundation only went down 18 inches), this was easier said than done. Bannon had to excavate one side by hand, installing sheathing as they dug to hold the next-door neighbor’s building in place. For three months of the ten-month process, the home was raised in the air by about two inches, explains Bannon, and stabilized while they excavated and built a new foundation. It was then set back down to where it was supposed to be. All the while, the third floor studio was occupied. It was a challenge to keep the water that was piped into the second and third floors from freezing (at one point the home was completely open to the elements), but the builder insulated and heated the pipes during the course of construction. Multiple changes arose during the project, and all were executed seamlessly due to the scrupulous eye of Project Manager Ed Lanoue. Keeping the fireplace intact was a difficult but rewarding task; it is central to the cozy and rich aesthetic of the first floor. He was also meticulous. At the request of the owner, Bannon Custom Builders labeled every single floorboard, removed them, stored them during the construction, and installed them in the exact same spot they had previously graced. The efforts were successful–the team was able to save most of the floors and salvage the fireplace as well. Ceiling beams were also preserved. After they were removed and a whole new floor system established, they were reinstalled. The home’s original front door was shipped to Upstate Door in New York to be replicated in mahogany before being reinstalled in the frame. What wasn’t preserved was duplicated, including all of the interior trim on the first floor as well as the interior doors. 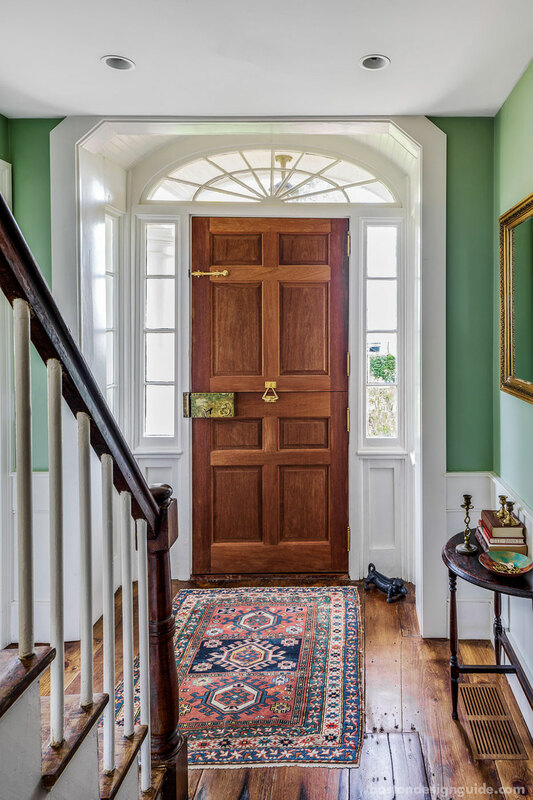 A few were crafted in mahogany, including a wonderfully welcoming front Dutch door, when the original couldn’t be salvaged. Double pane hurricane windows were selected to match the period, and muntins were custom made to match the original profile. The library, a front room of the house, is a vision in mahogany and one of Bannon’s favorite spaces. Sharp Woodworking was masterful with the cabinetry. Mahogany is laden throughout the home, including a striking front library with a versatile bed that can morph from a cushy daybed to two singles to a king. It’s perfect for when guests arrive to this vacation destination. And come they will.